It’s orange, orange, everywhere in Microgamings’ Mocha Orange pokie, with enough of the fruit to keep a small army topped up with vitamin C for a year, with even the symbols and background to the reels in the same colour. So anyone who like oranges will probably want to try spinning the 3 reels of this game and seeing what they can win when the right symbols land across the single payline. This traditional format remains popular, with players able to squeeze out lots of quick wins, while this particular game also features wild substitutions with multiplier wins and a jackpot of 1600 coins. This pokie is laid out in the classic style of so many others from Microgaming. They have become experts at developing 3 reel games and the software behind Mocha Orange is the same as it for a number of other successful titles, so why change a proven format? The point of difference is simply the fun design, and as long as the dominance of the colour isn’t off-putting, this game looks bright and cheerful. The reels are up in the top left corner and below them we see the game title in big, bold letters with a few oranges thrown in for good measure. The background image is obviously in the same colour, with a bit of a swirly design to it that could be trying to look like an orange, or maybe it’s just there for effect, but it looks nice anyway. There’s a bit of information about how the wild symbol and multipliers work, but we’ll get to that in a bit, while the right side of the screen is taken up by the payout table. Players set their bet sizes using the control buttons at the bottom of the game, with coin values adjustable from 0.25 to 0.50, 1.00, 2.00, 5.00, 10.00, 20.00, 25.00 and up to 50.00, while they can play with 1 or 2 coins for a maximum bet of 100.00 per spin. A maximum of this makes Mocha Orange more of a game for low and high stakes players so most people should be fine with it. 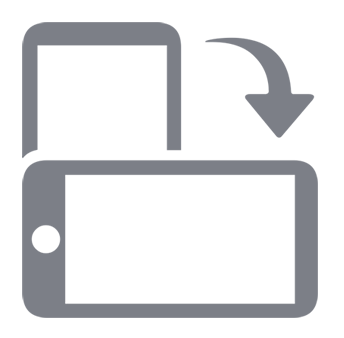 The payout table consists of 2 columns with different values that light up depending on whether 1 or 2 coins are in play, but as the ratio of stakes to wins are just the same, we will assume a single-coin bet is being made. Just double the amount won if the bet is doubled. All of the symbols are, predictably, tinted with various shades of orange, although it’s actually quite effective and adds to the pleasing appearance. At the bottom of the payscale we see a bell and landing just 1 of these across the centre line of the reels will be worth 2 coins. Next up is the 3 coin payout for getting any combination of the single, double or triple bar symbols across all 3 reels, while the bell then makes another appearance, paying 5 coins when 2 of them stop on the line. If the payline gets filled with the single bar symbol, then players win 10 coins and a full line of bells is worth 20 coins. The double and triple bar symbols reward players with 25 and 50 coins respectively when they land right across the reels on the line, and the traditional 7 symbol turns up as the highest value regular one, paying 100 coins for a full line, although nothing for any other combination. That is unless it lands in conjunction with the orange, which is a wild symbol that can act as any other if that will help to complete a winning line. If just a single wild completes the combination, the win is doubled in value, but if 2 wilds are part of the line then the resulting win will be quadrupled in value. A full line of 3 oranges is what players will really want to see, as this is the jackpot combination that pays 800 coins, or of course, 1600 if they are playing with 2 coins. At the maximum bet of 100.00, that equals a potential reward of 80,000.00. 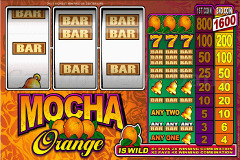 Mocha Orange may not have particularly original gameplay, but there are not many pokies themed around a single type of fruit and this one is certainly bright enough to grab players’ attention. It’s nice and easy to learn, has a wide range of potential bet sizes and that huge jackpot reward of 800x the amount wagered makes it a game well worth playing.